We strive to create a strong engineering community and support network that help our students be successful and make the most of their educational experience. Held in the mountain town of Prescott, Ariz., the three-day camp is designed to create a strong sense of community for our incoming class and introduce core concepts of team-building and problem-solving. Students learn engineering principles through team projects, physical challenges, competitions and workshops. Our new students have the opportunity to meet current students, faculty, staff, alumni and supporters in a welcoming environment that students say not only prepares them to start college, but gets them excited about being engineers. First-year students have the opportunity to enrich their academic experience through the Engineering Residential Community, a smaller campus community within the larger university. Residents have easy access to undergraduate academic support services such as tutoring, workshops, advising and study groups. Countless activities from sports to games to social events help connect new students to academic peers, mentors, faculty and others who share similar interests. The on-campus living and learning community significantly contributes to the successful transition into the university for freshmen. Barrett is a selective residential college that recruits academically outstanding undergraduates from across the nation. 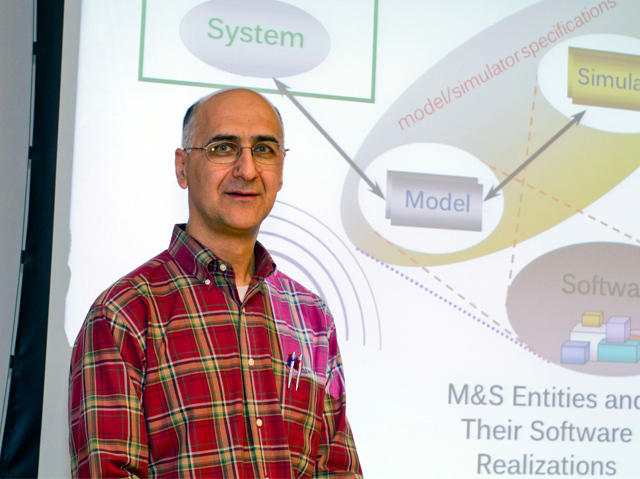 Engineering courses with an honors designation provide opportunities for collaboration with faculty on special projects and an expanded understanding of the course subject matter. 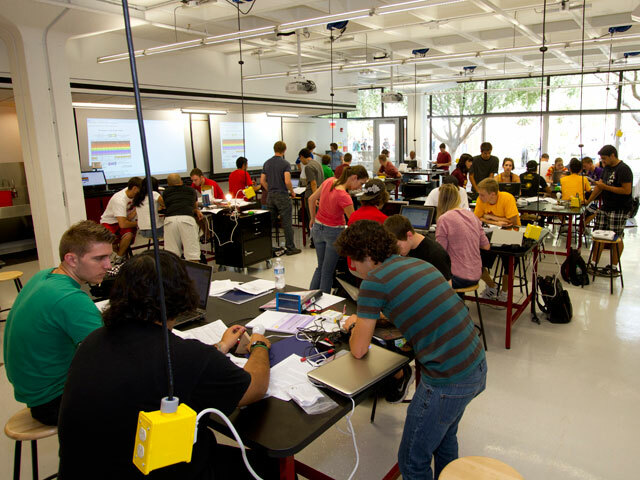 In fall 2012, over 15 percent of all undergraduate engineering students were concurrently enrolled in Barrett—the highest percentage of any school or college at ASU. As freshmen, our students take Introduction to Engineering (FSE 100), an interactive class designed to provide hands-on experiential projects and innovative curriculum from day one. Working in teams, students are introduced to the engineering profession as they learn the design process, engineering models and critical communication skills. Our engineering students complete their experience with a senior design class. During this capstone class, students bring the knowledge and skills gained during their undergraduate experience to bear on actual design problems. 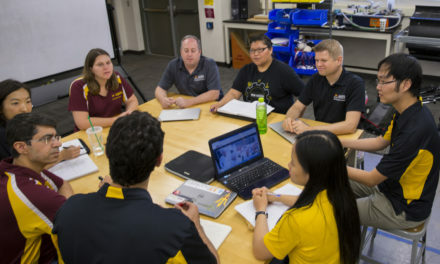 Many capstone projects are done in conjunction with ASU researchers and industry partners to create equipment and solutions that solve an immediate need. We are working to create an intermediate design class that sits between the freshman and senior classes, which would provide our students another valuable opportunity to put their growing skillset to work. Our senior capstone provides comprehensive design experience for our engineering students in the last year of their undergraduate studies, preparing them for the transition from student to practicing engineer. The capstone solidifies their knowledge and experience, giving students the opportunity to put their skills to work by solving a practical engineering design problem. Working individually or in teams, students take a project through definition, design, implementation and testing. They also must take into account budgetary, environmental, ethical, political and health and safety considerations, as well as design for manufacturability and sustainability. The capstone projects provide a bridge between coursework and industrial application. A critical component of the program is our network of industry partners. By offering a wide range of real-world projects, students can find the right match for their academic interests and career goals. Hands-on experience is an important component of our undergraduate experience and students are encouraged to explore opportunities to work with faculty, graduate students and other undergraduates on real-world research projects. Students develop confidence in their ability to be creative and innovative and gain insight to what it is like to be a graduate student at a research-intensive university. Our signature program is the Fulton Undergraduate Research Initiative (FURI). Students can participate in the program from the second semester of their freshman year through graduation. The research program combines research, mentorship, a stipend and research supply budget to enable undergraduate students to gain hands-on experience early in their education. The travel grant program helps students participate in national conferences and present their research. FURI began in 2005 with 35 students. Participation has quadrupled to more than 150 students last year. 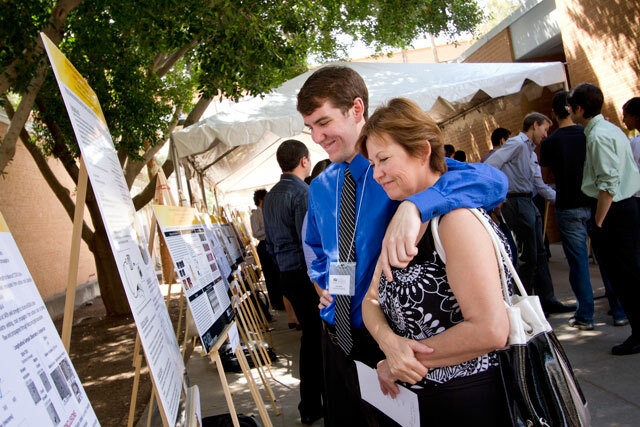 Over 180 students presented their research at the semiannual symposiums, attracting over 400 visitors. Endorsed by the National Academy of Engineering (NAE) in February 2009, the NAE Grand Challenge Scholars Program is designed to engage and encourage exceptional students through an innovative curriculum and cutting-edge research experiences. 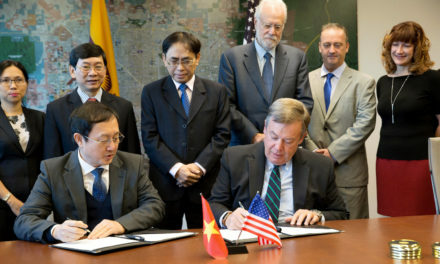 Through completion of the five components of the program, students have the opportunity to engage in research relating to their selected grand challenge, explore interdisciplinary coursework, gain an international perspective, engage in entrepreneurship and give back to the community through service learning. Fulton students who complete the program achieve the distinction of Grand Challenge Scholar, endorsed by ASU and the National Academy of Engineering. The 4+1 programs offer high-achieving students an opportunity to earn both a bachelor’s and master’s degree within five years. It is a cost-effective way to gain additional technical depth and specialization that can lead to expanded career opportunities as well as preparation for doctoral studies. Ten degree programs within the Fulton Schools of Engineering offer the accelerated 4+1 option.